It was a beautiful Sunday and a perfect day for an ordination. The hall was crowded, and everyone joyfully hugged and wished each other a mazel tov. There was a ritual, some spirited singing and clapping, giving of documents, speeches, and of course, food. Just like every other ordination I’ve been to. Each ordination was followed by standing ovations, cheering, clapping. As each woman spoke, with the joy and light of Torah streaming from her soul, all present were carried into the reality and power of the moment. Blu Greenberg presciently spoke of this possibility. And we were there, to see, to witness and to celebrate. As a Reform rabbi, I found myself wondering about my fascination with this moment, about the reason for my own tears, about the sense of witnessing history in the making. Accompanied by David (Rabbi David Ellenson), and with our trailblazer Rabbi Sally Priesand sitting just a few seats away, I could not help but reflect on how our world and our community have changed. I found myself wishing that I had been present for Sally’s ordination, even though at the time I was a 16 year old girl who knew nothing about the historic events unfolding in Cincinnati in 1972. But even though I have been present to witness the remarkable emergence of women’s rabbinic leadership in the Reform, Reconstructionist, Conservative and Renewal movements, even though my work brings me into daily contact with the reality of the lives of women Reform rabbis, even though women rabbis may not be seen as something new or innovative in the liberal Jewish community, I still felt the profound historical power of the day. I felt deeply that I was witnessing something that for so long and for so many had only been a distant and unattainable dream. Rabba Sara Hurwitz herself said it, “Halom halamti-I dreamed a dream.” Many have dreamed this dream and most of those dreams have not been fulfilled. Many wish they could have become a mahara”t. Yet, on Sunday, I witnessed women, Orthodox women, taking their rightful place as religious, halachic and spiritual leaders in the Orthodox community. On this day, many dreams came true. After the ceremony a friend mentioned that she thought the day would soon come when this ceremony wouldn’t be seen as so significant or so filled with history. I had to disagree. I still marvel at the reality of 686 women ordained as rabbis at HUC-JIR in the past 41 years. I don’t ever want to forget how amazing it is, how radical a reconceptualization of Judaism and of leadership it required. But I do think that one day, we will know that this is normal; that women in religious leadership, no matter what movement they may belong to, are an essential and vital expression of our community’s values. I don’t ever want to forget the struggles of individuals who blazed the trails in order for me to become a rabbi. But I do want to insure that women rabbis are an integral, integrated and recognized part of the landscape of Jewish leadership, that they claim their rights and responsibilities as legal and religious leaders, that they and their communities see their work as sacred work, that their presence in the religious sphere will have an immeasurable impact on current and future generations. No, I don’t ever want to forget how revolutionary the ordination of women as rabbis and mahara’ts is. But I do want them to be completely normalized, accepted and celebrated. I celebrate the rabbis and lay leadership who brought the dreams of this yeshiva and the possibility of women’s ordination into reality, who contributed their halachic and financial resources to create this innovative seminary. I rejoice in the ordination of Rachel, Ruth, and Abby, and in the fact that all three of them have positions within their communities, and two of them will be working as part of a clergy team in Orthodox synagogues. It was an ordination like so many others I’ve been to. And it was an ordination like none I’ve ever seen. 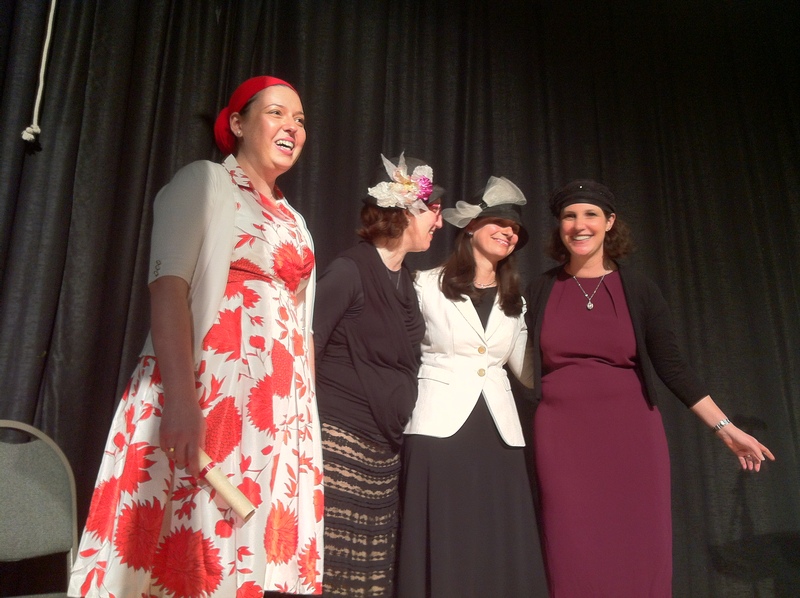 It was the ordination of women rabbis, something so regular and normal. And it was the ordination of Orthodox women as Maharats, remarkable and innovative. I remember how revolutionary, radical and controversial our ordinations were at the time. I remember how hard my predecessors worked to pave the road for me, and I know how hard my contemporaries and I worked to pave the road for our younger colleagues. There is still much to do, but we have also accomplished so much. But I take none of it for granted. It has all been a dream. And that’s why I celebrate. Rabbi Jacqueline Koch Ellenson is the Director of the Women’s Rabbinic Network.